The slow movement of the houseboat gently rocked us to sleep as we sailed through the magical backwaters of Kerala in India. My husband Duncan and I were feeling sleepy after our Indian Thali meal which had been freshly prepared for us by our own personal chef on board. Luckily, we had the houseboat to ourselves as we had taken over the prime viewing spot on the upper deck. Thunder rumbled in the distance as we meandered through canals once used for the transportation of rice when the roads in Kerala were in poor condition. These days, the roads have been repaired, leaving many of the old rice boats unused until someone had a great idea to use them as houseboats. 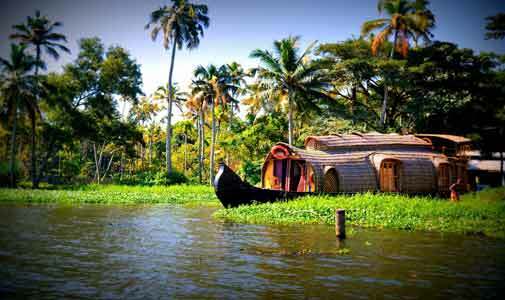 Houseboats now ply the backwaters of Kerala offering accommodation, from one bedroom to 12 bedrooms, all air-conditioned and most with en-suites. You can choose a traditional houseboat or a modernised replica. Cruises can be from one to seven nights. We were very happy with our rustic, two-bedroom vessel, with an en-suite bathroom and air-conditioning. We stepped into organised chaos a few hours earlier when we arrived at the dock. Hundreds of houseboats, doubled bunked, with crews getting ready to sail buzzed about. How would we ever find ours? A kind captain looking for his passengers showed us the way and we were greeted with lovely cheeky smiles from our crew. Sipping on our fresh coconut juice, the captain explained the safety procedures for the boat and our itinerary for the next 21 hours. As more thunder rumbled in the now very darkened black sky ahead the first few drops of rain were felt, our chef arrived with banana cooked in coconut and hot steaming coffee. He gestured towards the horizon and advised that we may have to move downstairs shortly so they could rain proof our boat. He did not care for thunder or lightning, he said, his face showing his concern. The storm allowed us just enough time to enjoy our afternoon tea before it started. Heavy rain slashed each side of the boat; the crew rushing to rain proof the top deck and sending us quickly downstairs to shelter. Within minutes the storm had passed, a normal occurrence at the end of the wet season here in Kerala. That night we pulled up alongside a canal bank and wandered down the muddy path to visit the local village whilst our chef prepared our evening meal. The rest of the crew closed down the houseboat to mosquito proof it. Other houseboats started to arrive with their passengers playing local Indian music and dancing to the beat. Our own private Bollywood performance…without the famous actors and dancers. Another excellent Indian meal from our chef was enjoyed. But who would have thought a day out sailing could be so tiring… It wasn’t too long before we said goodnight to the crew and headed off to our comfortable bed, the sway of the houseboat rocking us to sleep. With the morning sunrise came the hustle and bustle of locals heading out in their boats to work, taking children to school and visiting local markets. As the Captain pulled up anchor we headed to the top deck to watch the vibrant comings and goings of daily life. It was alive and buzzing and will live long in our memories. As we sailed gently along the backwater, women were doing their washing in the canals, men carried logs on their heads down pathways and young children giggled and played beside the river, trying to stay out of shouting reach of their parents. Just as we finished our breakfast on deck we pulled into dock and another day had started for our Captain and crew. So that was our trip: three incredible, well prepared and unique cooked meals, a trip on the calm and serene backwaters of Kerala and a night’s accommodation all for the grand total of $150. What an adventure.